Perfectly located in a gated secure development. Minutes from all amenities. One bedroom apartment with king size bed, a single pull out bed & a sofa bed in the living room. Hosting a large balcony overlooking the marina, infinity pool and the Siagne river. As south facing, it enjoys glorious sunshine throughout the day. A short walk along the river takes you to the beach. There are lots of restaurants, shops and bars nearby and the centre of Cannes is only a couple of miles away which is beautiful in the evening to dine out, catch a bus to Cannes for just €1,50 ! An extension of Mandelieu itself; La Napoule has a beautiful Chateau and Marina on the beach. Night market, shops, bars and restaurants. This is a 10 minute walk along the beautiful river, or a 2 minute car journey. Kitchen - Oven, 4 ring hob, fridge with small freezer compartment and washing machine. Living Area - Double sofa bed, TV, DVD, radio/CD player. Large Balcony - Spans across the whole apartment. Large round table seats 6. & 2 comfortable large lounge chairs. Bathroom - One bathroom with bath and shower attachment. 3rd Floor with lift access to secure underground garage parking. Cannes - is a short drive or bus ride away for only €1,50 EURO! Yes €1,50 EURO!! La Napoule - Has a wonderful Chateau overlooking the beach. Lovely walks towards Cannes or Theoule-sur-mer. Fireworks throughout the Summer. Night market & a lovely choice of local quaint restaurants overlooking the marina, beach or the chateau. Mandelieu - Has many shops, bars, cafes and restaurants all offering free local wifi. A twice weekly market full of local food & gifts. Beach - So many beaches to choose from. The closest is a short walk along the picturesque river. Golf Courses -There are many courses in & around the Riviera, but there are 2 excellent courses in Mandelieu itself. The first one is The Old Cannes Mandelieu course, all year round,18 hole par 71,located around the river Siagne.It also has a 9 hole par 33. The second course; The Riviera golf club is a lot newer , also an 18 hole par 72. There are also courses around Mougins Valbonne & Grasse. Skiing: For Winter sports there are many ski resorts within a 2 hour drive. The owner of this property will accept payment in British pounds or in Euros. All Laundry, bed linen, and towels (not beach) & for key hand over with all of your questions answered regarding your holiday in our Apartment in Mandelieu. Our agent will keep our Apartment spotlessly clean and tidy for all new guests arriving . A cleaning fee is payable upon arrival of €70 directly to our agent. We live in Hertfordshire and have owned our Apartment in Mandelieu for 11 years, it is in an ideal location for everything you need. I am self employed and have run my own business for 40 years. My wife has worked in Child care for 30 years in private Schools . We picked this location to purchase because it has a wonderful warm climate and was our preferred holiday destination for many years. There is a heated towel rail in the bathroom. Please note that the toilet is separate to the bathroom. There is a fitness trail and childrens play ground next to complex.Beach towels are not provided.The sofa bed in the sitting area folds down easily into a large double bed. This one bedroom apartment was perfect for our stay in the South of France. It is extremely spacious and has all the creature comforts of home. The kitchen is well stocked with equipment including an oven (however we didn't use it), a coffee maker and a washing machine. The living area is large with TV - again we didn't use it and it opens out onto a large balcony overlooking the pool. The balcony has a table and chairs as well as 2 comfy seats. The bedroom has a large double bed, huge wardrobe with masses of hangers and equipped with a fan and hairdryer and opens out onto the balcony too. The bathroom is modern with a bath and a powerful shower. The only thing the apartment lacked was air-con as it was very hot while we were there in August. The block itself is very well maintained, spotlessly clean and tidy. The pool area was lovely and never too busy even in the height of the summer. It did however lack sun beds! The apartment is very secure with gates to enter and a key fob (which sometimes was a bit temperamental) and a garage in the basement. However it was a very small garage and we did have difficulty fitting our Land Rover in!! There is parking out on the street if necessary. The cleaner arrived during our stay to clean which was a pleasant surprise and the management team responded to all our questions and requests. The owners too were extremely helpful and always replied to us promptly. The location of the property is ideal. Walking to the beach in 20 mins, along the river is a pleasant walk, however we tended to drive although parking is difficult in the busy period. Catching the bus to Cannes is so simple and cheap and an alternative for restaurants with more variety. In Mandelieu itself there are a few restaurants all within walking distance which were all very good. There is also a supermarket and a boulangerie very close by and a huge supermarket a mile or so away. There was so much to do and see in the area so a perfect holiday destination.We'd love to go again. Thank you for your review , we always enjoy positive reviews , in answer to the comments on the Garage , all the Garages are the same size in the Development and we have always found any car rental vehicle fits perfectly within the space allowed . The large Fans we supply are extremely efficient and we did not want the rather large air con unit taking up room on our balcony. Thanks again for taking the time to review and hope to see you again in the future. Lovely apartment in a suburb location. The property manager, Marie, was very helpful. We absolutely love this apartment. We have been lucky enough to visit a few times and every time it just gets better. This time we decided not to get a car and our journey from the airport was so easy!. A 10 minute walk from the airport to Nice St Augustin... 25 minutes on the train to Cannes. We stopped off at our favourite place Le Grand Café for a pichet du rose! and then hopped on the 2 euro bus that dropped us 2 minutes from the apartment! Easy peasy! The apartment itself has everything you could want or need, and you just can't beat eating on the balcony every day! Just perfect! Book this wonderful place, you couldn't possibly regret it! Thank you Victoria for your review , we are so pleased you like our home in France , the experience with the Bus is a great idea for other travellers. And yes the chilled wine on the balcony tastes wonderful as the sun goes down. Thank you very much for taking the time to review our property. We are delighted you enjoyed your stay! Look forward to seeing you back soon. Our trip to South of France! We had a very enjoyable stay in this beautiful apartment. The listing description is accurate and the property was very well maintained and clean. It was very hot during our stay so we spent a lot of time in the pool and sitting on the large balcony. We were a group of 3 and found everything we needed, the beds were very comfortable. Mandelieu la Napoule is a lovely town and everyone we encountered was very friendly and helpful. So easy to get the bus to Cannes! Excellent customer service from the owner and would definitely recommend the property to friends and relatives. My husband and I had a fantastic time in this apartment. It is in a beautiful area looking on to the boats and the river, which is a gorgeous walk right along to the beach. You are in close proximity to the surrounding areas such as Cannes, and sitting on the baclony for our meals was certainly a highlight. We would highly recommend it here. 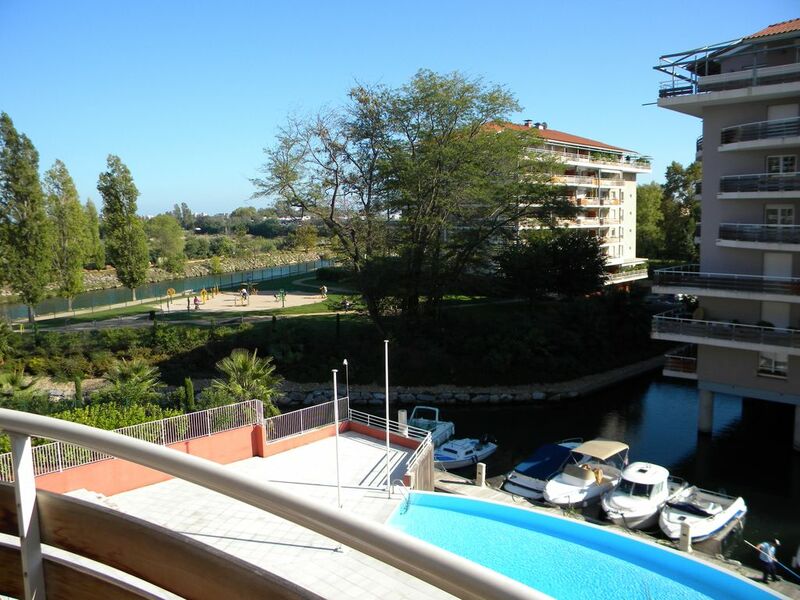 Mandelieu boasts lovely sandy beaches with many water sports,golf courses& peaceful walks along the River Siagne which is adjacent to the apartment. Other Activities: There is also a ten pin bowling alley in La Bocca 2km.